Hamilton Ross Group Valtra Expert, Brian Hamilton; Police Scotland National Rural Crime Co-ordinator, Alan Dron; Hamilton Ross Group Marketing Manager, Corrine McConnachie and Marketing Assistant, Rachel Mullin. Last month a leading Fife farmer warned the spate of tractor thefts in the area by organised criminal gangs had the potential to escalate into a “danger to life and limb”. 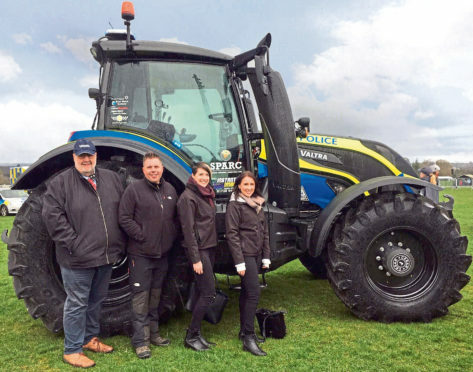 In a bid to raise awareness of the problem the Scottish Partnership Against Rural Crime (Sparc) has branded a Valtra tractor with Sparc and police logos before sending it on a tour of 30 summer agricultural shows. The Hamilton Ross Group supplied the tractor and the company’s managing director, Eric Gardiner, said they saw first-hand the impact rural crime has on the lives of customers. He added that modern-day trackers, advanced technology and policing meant they also saw the opportunity to help prevent rural crime. The creation of the branded tractor follows the popularity of a similarly branded tractor at last year’s Royal Highland Show. Alan Dron, the rural crime co-ordinator for Sparc, said attending agricultural events and shows was just one way the group would be engaging with people. Sparc is made up of partners from across the rural community. These include Police Scotland, NFU Scotland, Scottish Land and Estates and NFU Mutual.